Marko Grujic is having a good season for Hertha Berlin, seemingly growing into the young footballer Liverpool had a good idea he would become. WhoScored rate the 22 year old as easily Hertha Berlin’s best player of the season, and he’s been winning fans in Germany this campaign. He has ten appearances in the Bundesliga so far this season and if it hadn’t been for a couple of ankle injuries that figure would be higher. On a contract with Liverpool until June 2023, there’s no worry in that regard, so the Reds would be able to loan the youngster out for a further season without fretting about a renewal. This week’s edition of SportBild explains that’s exactly what the Premier league club are leaning towards. Jurgen Klopp’s club want to see Grujic getting European football, and with Hertha in 9th that could be a struggle. 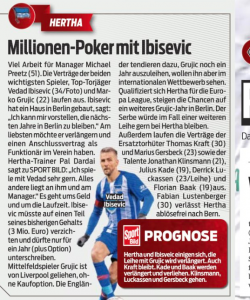 Hertha want another loan, SportBild say the player also does. His good season will mean that if Liverpool are absolutely set on European football, and Hertha can’t provide that, there shouldn’t be too much trouble finding another home. Even without UEFA competition, a Hertha stay could be the better compromise.